It's been a busy news week for Charlie Sheen, but for us, it hasn't been in the world of home media news. The world of DVD and Blu-ray gets a little slower each and every week, but that doesn't stop us from being here, no matter what! This week, we've got a review of the PBS series Pioneers of Television - Season 2, the series that gives a retrospective of the earliest days of television. Let's get going! A few months ago, TMG released a two-disc set of the classic Betty White series Life With Elizabeth, but they aren't stopping there! Now, they are preparing a two-disc set of Betty White's other series from the 50s, Date with the Angels. The 12-episode set will be released on April 26 at a very low $9.98 MSRP. A few weeks ago, Shout! Factory announced that they would be releasing the first season of the Nickelodeon series The Wild Thornberries. We didn't mention it because it is a bit beyond the scope of our website, but something that didn't catch our eye was this post from Brian Ward on the Shout! Factory Community message boards mentioning that other Nickelodeon series are in the works from Shout! Factory. Now, as to what they'll be or when they'll be announced, there is no telling, but hopefully this will include some sitcoms from the Nickelodeon library. These specials began in November 2005 on PBS with The Pioneers of Primetime which focused on vaudeville headliners, radio superstars and television legends. In 2008, four one-hour specials were made that profiled late night, sitcoms, variety and game shows. 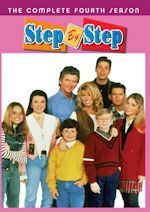 Season two premiered in January and February 2011 and took a look at science fiction, westerns, crime dramas and local kids' tv. 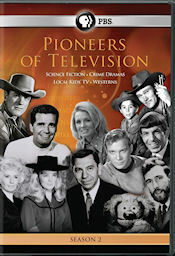 The cover art features a montage of black and white photos of James Arness, James Garner, Barbara Stanwyck, Linda Evans, Angie Dickinson, Rod Serling, William Shatner, Leonard Nimoy, Chuck Connors, Johnny Crawford and Jim Henson. The episodes are presented in widescreen format. The recent interviews look excellent, but some of the vintage show clips vary in quality. The main menus features the same montage of black and white photos as the cover art. There are options for Episode Selection, Scene Selection and Set Up. Subtitles are available for the deaf and hard-of-hearing. The set has a running time of approximately 220 minutes. Science Fiction (01/18/11 - 55:09) - Leonard Nimoy, William Shatner, and Nichelle Nichols reflect on the birth of Star Trek. Lost in Space is remembered by Bill Mumy and Angela Cartwright. And a lost interview with Rod Sterling highlights a look at The Twilight Zone. This episode focuses on three key science fiction series: Star Trek, Lost in Space and The Twilight Zone.. A surprising connection between Star Trek and Lost in Space is uncovered. Star Trek topics covered include Gene Roddenberry's story and the development of the show, William Shatner and how he was cast, Leonard Nimoy and the development of Spock's ears, and Nichelle Nichols and TV's first interracial kiss. Lost in Space topics include Irwin Allen's story and the development of the show, Jonathan Harris' portrayal of the Zachary Smith character, Irwin Allen's creation of The Time Tunnel, and the classic The Great Vegetable Rebellion episode. The Twilight Zone section details Rod Serling's early days, memorable episodes with guest stars William Shatner and Bill Mumy, Rod Serling's favorite episode, the special effects on the show, and the end of the show and Rod Serling's later projects. Others interviewed include Marta Kristen, Veronica Cartwright, Peter Graves, Lee Meriwether, Adam West and Martin Landau. Some bonus pioneering moments in science fiction are shown in the closing minutes. Westerns (01/25/11 - 55:08) - James Garner (Maverick), Robert Conrad (Wild Wild West), and James Arness (Gunsmoke) are just three of the pioneers who talk about their experiences in this episode -- which also includes Linda Evans (Big Valley) and Fess Parker (Daniel Boone). Classics like Bonanza and The Rifleman are also featured. From the mid-1940s to the mid-1970s, there were more than 100 different western series. In the 1959 season alone, there were more than 30 on the schedule. Gunsmoke, Bonanza and The Rifleman are among the iconic series profiled in this episode. James Garner talks about how he never wanted to become an actor, how he was picked to play Bret Maverick on Maverick, and his later television roles. Sam Peckinpah created his first TV series, The Rifleman, in 1958 starring Chuck Connors and Johnny Crawford. Mr. Peckinpah left after the first season. Bonanza topics include Dan Blocker, Michael Landon, and the lack of female characters on the show. The Big Valley would be the first western with a female in the lead role. Barbara Stanwyck played the matriarch of the Barkley family. Linda Evans played her daughter and offers a touching new perspective on her co-star. Premiering the same season as The Big Valley, The Wild Wild West was one of the most unconventional westerns. Robert Conrad did many of his own stunts and details the on-set accident that cracked his skull. Gunsmoke's story details the casting of James Arness as U.S. Marshal Matt Dillon, the show's popularity over 20 seasons, and some of the show's other cast members including the break-out character of Chester played by Dennis Weaver. In the last interview with Fess Parker, the star of Davy Crockett and Daniel Boone, he talks about his effort to cast African-American guest stars at a time when that was rare. The High Chapparal featured Henry Darrow as Manolito Montoya and had Hispanic actors speaking in Spanish. Others interviewed include Robert Culp, Ed Ames, Linda Evans, Veronica Cartwright, Rosey Grier, Ernest Borgnine, Johnny Crawford, Darby Hinton, Henry Darrow, Peter Graves, Stephen J. Cannell, Stefanie Powers, Pat Crowley, Mitch Vogel, Adam West, Chuck McCann, Martin Landau, Mike Connors, Dennis Weaver, Angie Dickinson and Buddy Ebsen. A montage in the closing minutes features some other westerns and cast members. Crime Dramas (2/1/11 - 55:09) - This episode begins with the 1950s Dragnet and the Untouchables; includes 1960s hits Mission: Impossible I Spy and Hawaii Five-0; and wraps with 1970s favorites Rockford Files, Columbo, and Police Woman. Dragnet began as a radio drama on NBC on June 3, 1949. In 1951, the television series debuted. Topics include an innovation by Jack Webb that made it possible for them to shoot an episode in just one or two days, close-ups to show emotion, and the famous "just the facts, ma'am" quote. The Untouchables was one of the most violent shows on television. Another show created by Desilu, Mannix starred Mike Connors. Mike Connors talks about how they sped up the pace of the show with 50 set ups a day. Mission: Impossible stars Peter Graves, Martin Landau and Barbara Bain independently reveal the eerie connection between their series and actual cold war events. They talk about the make-up and how they got to play somebody different each week. 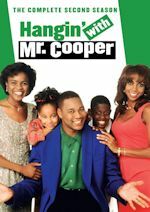 I Spy featured Bill Cosby as the first African American male in a lead role on TV. Bill Cosby talks about his groundbreaking role and the challenges he faced. Co-star Robert Culp also discusses his work on the show. Hawaii Five-O featured Jack Lord as Jack McGarrett. Lord's involvement in the show is detailed. Most of the actors on the show were local Hawaiian actors. Women stars of crime drama included Anne Francis on Honey West, Stefanie Powers on The Girl from U.N.C.L.E., and Angie Dickinson on Police Woman. Stefanie Powers talks about her outfits on the show. Angie Dickinson explains her conflict with the feminist movement. Columbo starred Peter Falk. He made the character his own and brought his trademark trenchcoat from home and picked out Columbo's car. Stephen J. Cannell discusses the creation of The Rockford Files. James Garner talks about his role and stunt driving on the series. Others interviewed include Leonard Nimoy, Pat Crowley, Veronica Cartwright, Stan Freberg, Gavin MacLeod, Bruce Bilson and Rita Moreno. Some still images and trivia are shown in a montage in the closing minutes. Local Kids' TV (2/8/11 - 55:09) - Jim Henson, Willard Scott, and Fred Rogers are among the performers who started their careers in local TV. These three icons -- and a dozen others -- are featured in this episode that highlights the clowns, pirates, spacemen, and puppets who made local kids' TV memorable for a generation. The Wallace and Ladmo Show began in 1954 and aired in Phoenix, AZ for over 35 years. Bill Thompson, Sharon Kelley and Pat McMahon discuss their work on the show. Stan Freberg talks about a Time for Beany which aired in Los Angeles for 5 years. Jim Henson got his start on Sam and Friends in Washington, DC. His innovations in puppetry are discussed. Joan Ganz Cooney talks about the development of Sesame Street. Fred Rogers disusses his early work on television off camera and the start of his own show where he would appear on camera. Chuck McCann comments on Puppet Motel and later The Chuck McCann Show. Steven Spielberg recounts the Arizona kids' show, The Wallace and Ladmo Show, that shaped his career. Marlene Manderfield discusses Romper Room, which had localized versions across the country. Socorro Serano talks about the strictness and uniformity of the show. Mary Ann King documents the chain of events that led to a lion escaping on the set of Romper Room in Los Angeles. The history of Bozo the Clown is detailed. Willard Scott explains the surprising physical challenges of playing Bozo in Washington, DC. Dan Castellaneta reveals the inspiration for The Simpsons' Krusty the Clown. The Action for Children's Television is briefly mentioned. Bill Cosby, Prof. Gordon Berry PH.D., and Lou Scheimer talk about Fat Albert and the Cosby Kids. Others interviewed include Ernest Borgnine, Bill Mumy, and Susan Harmon. This is a very interesting and entertaining series on the pioneers of television. These episodes are well made with many new interviews, vintage clips and still images. It's sad to watch some of the final interviews of Robert Culp, Peter Graves, Fess Parker and Stephen J. Cannell, who we all lost in 2010. They are able to put a lot of information in one-hour episodes, but they could really benefit by extending them to two hours. There are only able to cover so many shows and people in detail with the one-hour format. The science fiction and crime drama episodes were the most interesting to me, since I've always been a fan of those television genres. 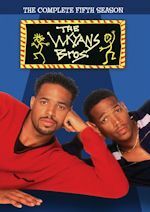 The local kids' tv episode was fun, but I think it focused a little too much on The Wallace and Ladmo Show, which may have only been familiar to people who live or have lived in Phoenix, AZ. Season two is a nice follow-up to the first four episodes. I liked the first season with sitcoms, late night, variety and game shows a little more than the second season, but there should be something for everybody to enjoy on this release. It seems like they are taking ideas for more episodes on the Pioneers of Television Facebook page. I would like to see new episodes on network news and live events, Saturday morning kids shows, animated series, medical shows, music shows and reality television. Thanks to PBS for bringing us some quality programming. 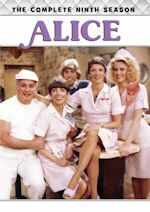 Tuesday (March 8) is mostly a dead day for new releases, although there is one classic TV release that we won't be covering here. VEI is releasing McMillan & Wife - Season Three in Canada at a $39.95 MSRP. This has been a very sad and disappointing week, but we can only give you what we have when it comes to news. But we'll still be back next week with more news (let's hope this stuff starts to pick up) as well as a review of the Canadian hit comedy series, The Red Green Show - The Delinquent Years. Until then, keep it digital!